Reading Rocketship Galileo. How's a thorium- zinc nuclear thermal rocket sound? Weren't the late 40s fun? kunkmiester wrote: Reading Rocketship Galileo. How's a thorium- zinc nuclear thermal rocket sound? Weren't the late 40s fun? 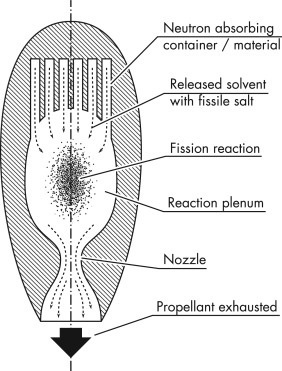 In an NSWR the nuclear salt-water would be made to flow through a reaction chamber and out an exhaust nozzle in such a way and at such speeds that critical mass will begin once at the chamber is filled to a certain point, however, the peak neutron flux in the fission reaction would occur outside the vehicle. 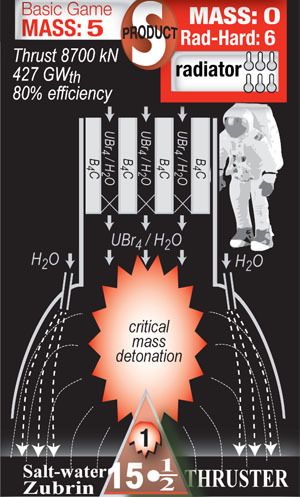 Due to their ability to harness the power of what is essentially a continuous nuclear fission explosion, NSWRs would have both very high thrust and very high exhaust velocity, meaning that the rocket would be able to accelerate quickly as well as be extremely efficient in terms of propellant usage. Such an engine being able to produce both high thrust and high ISP is a very rare trait in the rocket world, owing to the possibility to use a low density propellant such as hydrogen. One design would generate 13 meganewtons of thrust at 66 km/s exhaust velocity (compared to ~4.5 km/s exhaust velocity for the best chemical rockets of today). Couldn't use it as a launch system of course at least not from earth; theoretically capable of achieving orbit under earth's gravity I believe but the exhaust would be radioactive. Of course in the post BFR stage we could imagine any no. of systems like this or straight up NPR being used from high orbit assuming Polywell or related fusion rocket tech never takes off. Last edited by williatw on Sat Jun 02, 2018 12:23 am, edited 1 time in total. 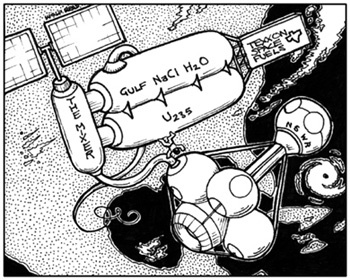 A "proper" Orion reference in regards to rocketry, unlike the vast majority I've seen lately. This was just a thorium reactor, with boiling zinc as the fuel. I'm not sure that would work, but considering it was first published in 1947, there probably wasn't a lot well known about how reactors work. It is also probably the first plot involving space nazis. I hate Space Nazis, especially those from Illinois! I was raised with a set of Encyclopedia Britannicas in the home, dated 1944. The article on Atomic Energy was surprisingly thorough, considering this was a year before Hiroshima. I recall it included both reactors and the prospect for nuclear weapons. Because most of the people capable of contributing to the article were then in the Manhattan Project, I found the article an eye-opener. As I understand it, the article first appeared in the 1939 edition. This itself is amazing, as fission was discovered late in 1938. In less years than you can count on one hand, physicists were building working reactors. I remember my dad had these extremely old encyclopedias, one was from the early 30's and talked about Nazi Germany. Another talked about the rise of the chemical industry. It stated that toxic waste was being buried underground. How it would be impossible for the economy to grow fast enough to deal with the waste when it started leaking. It finished off about the waste problem by saying it was one of the exciting challenges future generations would face. [i]This infrared image shows the dust ring around the nearby star HR 4796A in the southern constellation of Centaurus. It was one of the first produced by the SPHERE instrument soon after it was installed on ESO’s Very Large Telescope in May 2014. It shows not only the ring itself with great clarity, but also reveals the power of SPHERE to reduce the glare from the very bright star — the key to finding and studying exoplanets in future. Artist’s concept of the prototype starshade, a giant structure designed to block the glare of stars so that future space telescopes can take pictures of planets.